Our special contributor Ben Mattlin, writes about his recent hospitalization in his latest post for FacingDisability.com. 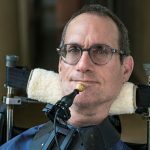 Ben, 55, was born with spinal muscular atrophy, a congenital muscle weakness that causes paralysis and related health issues. A highly regarded writer, Ben’s work has appeared in “The New York Times,” “The Washington Post” and “USA Today.” He lives in Los Angeles with his wife and children. In the first few days of this year, I was rushed to the emergency room. “We need help,” I’d gasped to my wife before she dialed 911. I had had a persistent fever and extreme difficulty breathing. Because I was born with spinal muscular atrophy, my lungs are dangerously weak even on my best days. The EMTs promptly gave me oxygen, which was continued in the ER. I was also given a nebulizer with levalbuterol, which I’d already tried at home. Nothing was helping. I don’t know much time passed before I started spouting random, nonsensical numbers (or so I’m told). Then I passed out. When I came to the next morning, I was on a ventilator and a couple of nurses were torturing my nose. Actually, they were inserting a nasal gastric (NG) tube to provide nutrition. Same difference. It hurt like hell. We learned that I had had too much carbon dioxide in my system. Perhaps the problem wasn’t so much that I couldn’t breathe in as that I couldn’t breathe out. In any case, I had the flu—Influenza A, to be precise—plus pneumonia. So much for the flu shot three months earlier. I was pumped full of antibiotics. Soon I grew bored, antsy, annoyed, and itchy. Itchy? One of the antibiotics was causing an allergic reaction. As for annoyed, one of the reasons was that I’d just had a new article in The New York Times—a “Modern Love” column I’d been trying to get published for years. I had wanted to savor the moment, respond to the many generous email messages I was sure I’d received. I also had a book coming out in about two weeks, and I wanted to get cracking on publicity. But all that would have to wait. I weaned off the ventilator as quickly as possible; I know how easy it is to become dependent on one. But that first pneumonia was followed by a second one. More antibiotics. The staff was mostly kind and attentive. But it seemed there were always more hurdles. For instance, to have the NG tube removed, I had to pass a swallow test. I failed. I knew from previous experience that I swallow better without a tube up my nose and down my throat. So I asked if the tube could be removed before the next test. The lab medic said she would ask the doctor. Later that day I put it to one of the pulmonologists. The next day the tube was removed. I passed. Not that eating was easy after all that. I couldn’t really sit up at all. If I tried, I became dizzy and breathless. All I could handle were very small bites. But I drank a lot of nutritious drinks. As anyone with a disability who has been in a hospital knows, you tend to be seen not as an active human being but as a collection of symptoms, of problems to solve. No matter how much they smile or make small talk, the personnel can be a tad, well, impersonal and dense. Too often, you don’t get listened to. “Do you want the lights left on?” a nurse’s aid might ask. “No? Okay.” And off they go, no matter what preference is actually expressed. What’s painfully obvious is that they have no idea about the rest of your life, who you really are. I finally told one medico to Google me. I was hoping that whatever pictures and videos I have online would paint a different, fuller and more accurate image of who I am. Still, there were several positive aspects to this two– week incarceration that made me smile. First, the beds have alternating-air mattress toppers, to reduce bedsores, which wasn’t true at my last hospitalization 10 years ago (when I got a nasty bedsore). 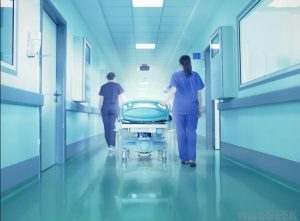 Second, for transfers to, say, a CT scan or the swallow lab, I didn’t have to be lifted onto a gurney to get from point A to point B; my hospital bed was rolled through the corridors, making for a much smoother transition. Third, everybody made sure that the right medication went to the right patient, unlike in times past. Nothing was done without first scanning my ID bracelet and checking the computer. It’s been more than two months since I got home. I am still exhausted and frequently short of breath. I looked it up online, in fact, and apparently it’s not unusual for pneumonia survivors to take three or even six months to feel back to normal. It so damages the lungs and other body systems that, even when the infection itself is gone, it leaves destruction in its wake. And as I said, my lungs weren’t so great to begin with! Nevertheless, I’m thrilled to have survived another close call. As a disabled person, I know that medical (and sometimes technological) interruptions like this happen periodically. But that’s all they are. I’ll soldier through the ordeal, or adapt my life around it as necessary. It won’t derail me from what really matters. The wisdom of disability? Perhaps. But I think it’s just the benefit of experience, mixed with the triumph of hope. Love your style of writing. It’s humorous, yet gets the point across………..very interesting, entertaining & admirable. I volunteer at Shepherd Center in Alt., & our son is in a wheelchair. Thanks for this nat article. Hugs! Glad to read you’ve recovered and that your experience in hospital care was more inclusive and understanding than it was in the past. Hopefully the improvements will keep on, there’s still so much to be done!